The full CO2 pistol kit from Daisy represents incredible value and comes complete with everything you need to get shooting, straight out of the box. The pistol fires 4.5mm BBs with high accuracy and features a 21 round magazine and semi automatic action that will keep firing as fast as you can pull the trigger. The gun is also equipped with a manual safety to prevent accidental discharge and it makes it a great pistol for teaching younger shooters the importance of gun safety. 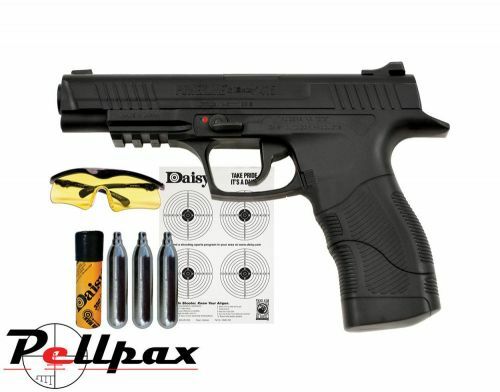 The pistol comes complete with BB's, CO2 protective glasses and paper targets to get you shooting straight away. - Muzzle Velocity : 495 fps. - Overall Length : 8.6"